Click below to take a listen with rabid mode on higher gain setting directly through speaker sim! 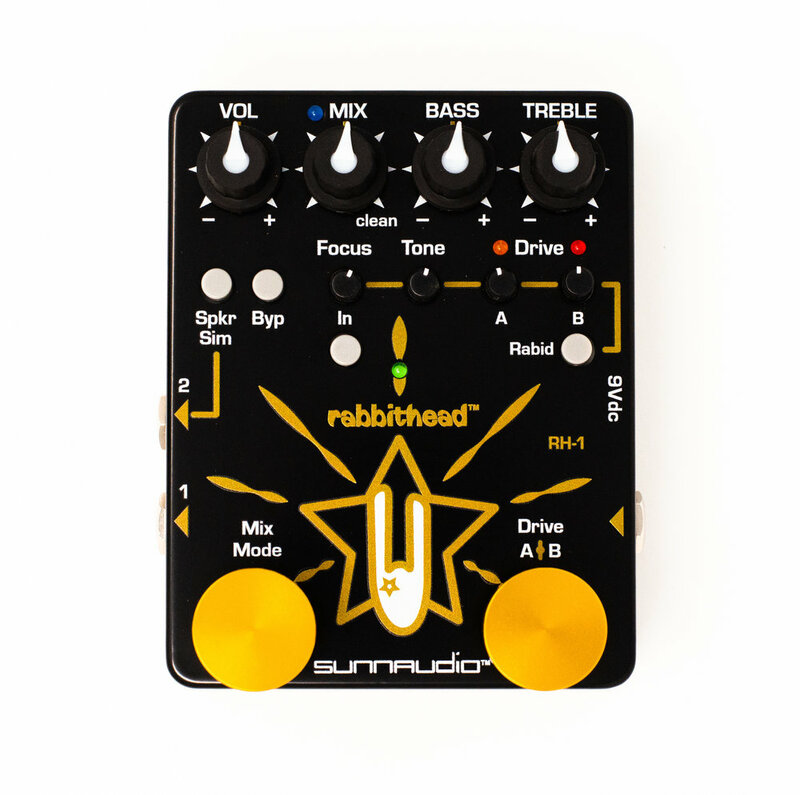 Rabbithead spring release Sale 25% off ALL sunnaudio products through April 26!! Rabid deals - 25% Off! Checkout our Rabbithead Shirts too! RH-1 Preamp: Clean Mix & Drive -A through clean sounding tweed deluxe reissue. Shooting vid for rabbithead. Thanks Jacob! Met up with some of the band members “Your Favorite Enemies” and showcased the new rabbithead pedal. Great group of guys! Rabbithead™ Pre-amp Overdrive Pedal - Now Available! use with Acoustic instruments, passive or active pickups, electric or acoustic guitar, bass guitar, electric violin etc… Rabbit don’t care! 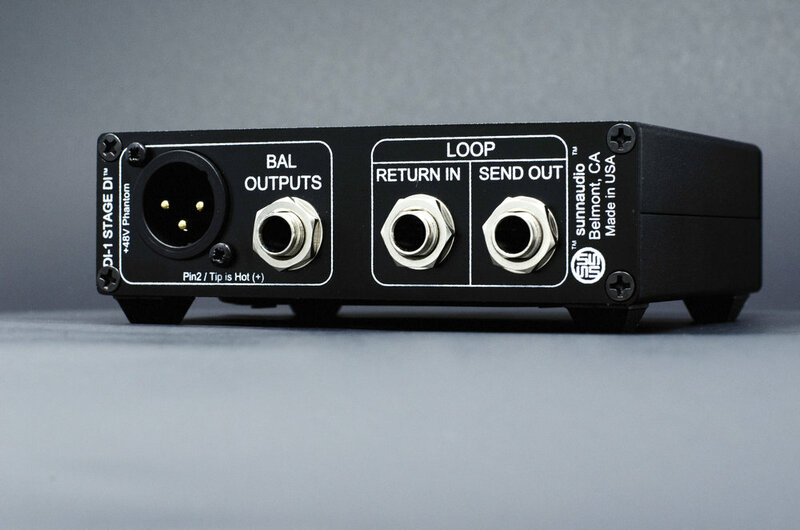 The Rabbithead™ RH-1 is a versatile all analog pre-amp that offers multiple tonal features for various instruments. Add saturation to your clean tones in Mix Mode or used independently for a variety of tones. Two switchable overdrive settings along with our Rabid™ grizzled distortion mode. World class overdrives that provide dynamic sounds to cut through the mix, or dial in some smooth lead tones. Bass guitars achieve true organic amp-like tones with the mix mode. The RH-1 also works wonderful with other drive pedals! Featured in Acoustic Guitar Magazine Gear Review December 2018 Issue! Just like our TD-1 Tone Driver, the DI-1 offers the same clear, full, rich, and complex overtones with Bass, Treble and Volume controls. Variable sub-harmonic bass adjustment optimal for adjusting low bass sub woofer frequencies. 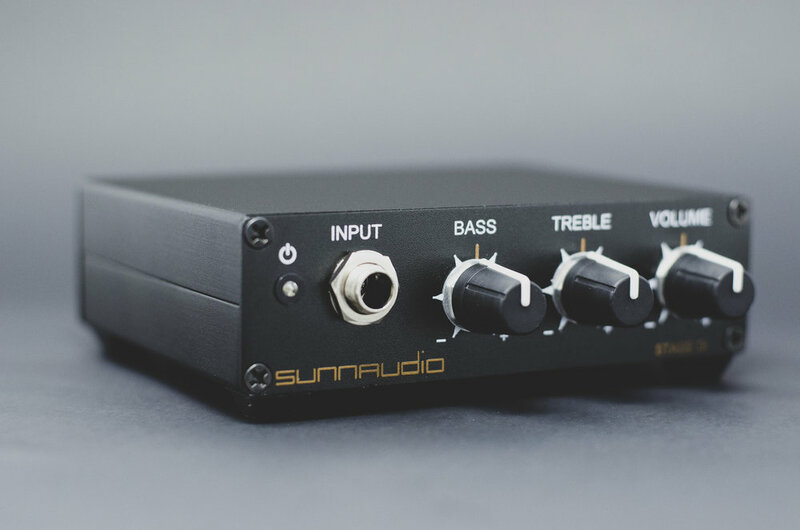 Sunnaudio is a relative newcomer to the market, offering boutique preamps designed for acoustic instruments. The California company makes four products with similar electronics and sound quality, but with different form factors for different applications. The Stage DI ($299) is a standalone unit with volume, bass, and treble controls; XLR and 1/4-inch balanced outputs; and an effects loop. The TD-1 Tone Driver ($179) mounts inside the guitar to support a passive pickup system. The BL-1 Blender ($169) is an onboard preamp for dual-source pickup systems, while the LD-1 Line Driver ($119) is an endpin preamp, with an optional volume control. All of these preamps are battery operated, although the Stage DI can also be phantom powered. For testing the Stage DI, I used pickups from K&K, Dazzo, Barbera, and McIntyre. The preamp was clean and very quiet, while providing enough gain (12dB) for low-output pickups, as well as a 5 Megohm input impedance to accommodate piezo pickups. The Stage DI’s frequency response is tuned to complement acoustic guitars. Its bass and treble controls offer gentle boosts and cuts, allowing you to tailor the sound to taste while avoiding extreme EQ. This results in a good tone regardless of setting, while still offering a range of sounds. 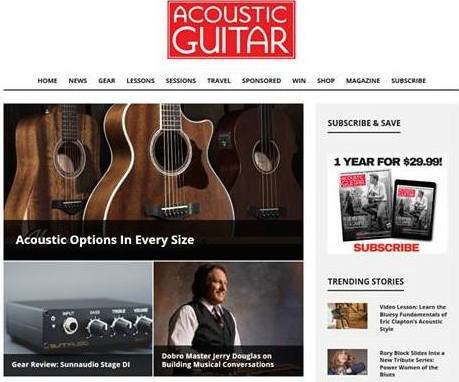 This article originally appeared in the December 2018 issue of Acoustic Guitar magazine. Plug in at our booth via headphones, blues jr amp, or PA - bring your instrument or play through ours! Come visit us at our booth at the 2019 “California World Guitar Show” in San Rafael. We would love to talk about our new products, chat and share stories! 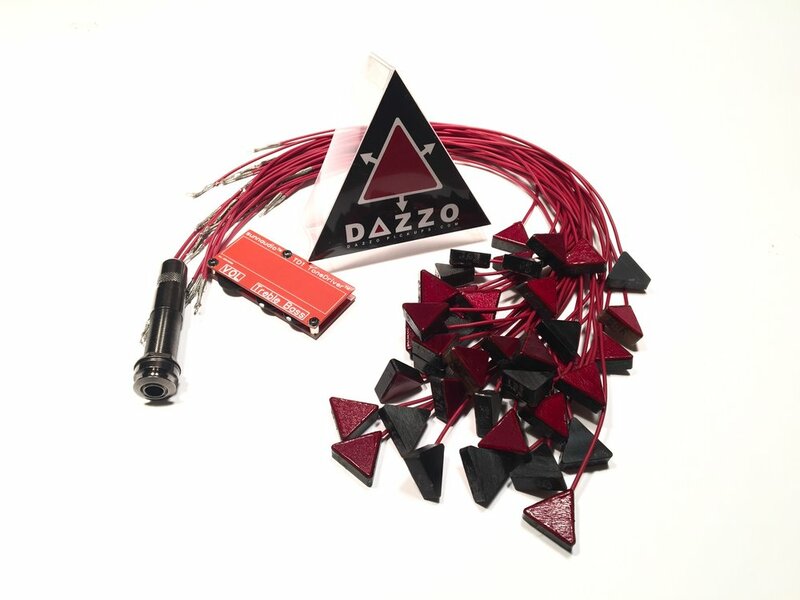 We will have our products ready to try out: Stage-D1, Rabbithead™ RH-1, and our internal preamps. Our brand new Rabbithead™ RH-1 overdrive and Stage DI will be available to play through an amp or headphones. We will be offering the RH-1, Stage DI and other preamps for a big discount at this show only! T-Shirts will be for sale as well - there will be a limited amount and you can always order with us if we do run out. See you there! Sunnaudio is a team of professional engineers and musicians with 40+ years of combined experience in live performance, design, and studio work. Our goal is to provide a variety of no-compromise solutions that bring out the best sound from your instrument and pickup. Our line of preamps and electronics are engineered to give you the best sound plus the technical features to meet demanding live and studio applications. Every model features unmatched dynamic range, full bandwidth, and quick harmonic response. Every time and any time you play. Let your music shine. That is our one simple goal.